For those wishing to learn more about their Royal Enfield bicycle, please email the National Cycle Collection who has graciously agreed to answer your questions about your Royal Enfield bicycle. You could visit the Cycle Museum Website or better still, visit the museum. The bicycle industry was one of the high-tech sectors in the late l9th century, so it is no coincidence that many cycle firms went on to become producers of cars and motorcycles. 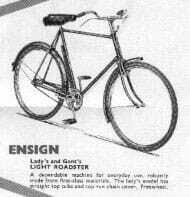 The Enfield Cycle company produced a range of good quality bicycles and also made proprietary parts for other manufacturers under the Eadie name. The field gun motif first made its appearance on the headstock badges and was fretted out of the chain wheels of bicycles. Later on, the expertise in bicycle frame construction was used to create the firm’s first powered vehicles, the quadricycles, and tricycles of 1898 which had DeDion engines mounted behind the rear axle. The connection was even more obvious when the first motorcycle was produced in 1901. 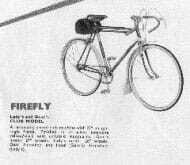 It was a sturdy bicycle with a small engine mounted in front of the steering stem. As motorcycles developed, they began to diverge from the bicycles with the need for heavier frames and cycle parts to cope with the rigors of powered travel, but bicycle production continued as an important part of the firm’s output for the same span of time as the motorcycle production at Redditch. Pedal cycles accounted for a considerable part of the company’s war efforts, during both First and Second World Wars. 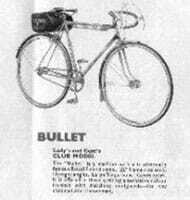 After WW II they led the way with all-welded frames and the Bullet name which was used in the motorcycle range also appeared on sports bicycles. Even after the closure of the Redditch factory, the name was perpetuated on bicycles made in Birmingham under the Royal Enfield name.